Slowly, but surely, electrical vehicle infrastructure is coming to Santa Fe, NM. 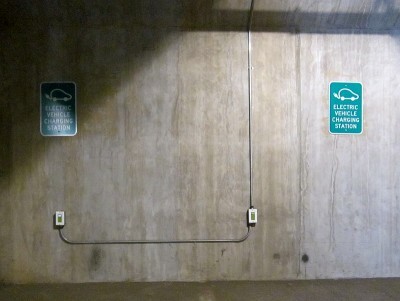 There are two Level 1 Charging Stations in the Santa Fe Railyard Parking Garage on the first level. They aren't very exciting to look at, but these are the first municipal 'electric refueling' stations in our town. For an $.25/hour up to a maximum of $1.00, in addition to parking fees, you can recharge your plug-in electric car while you shop, dine or browse the Railyard. A Level 1 Charging Station provides electricity through a 120 Volt AC plug. Most, if not all, electric vehicles come with a Level 1 EVSE cordset so that no additional charging equipment is required. Level 1 charging stations can deliver about 1.6 kW/h and are suited to 'topping off' a Leaf, Volt or a Plug-in Hybrid battery. The city of Santa Fe has plans to provide Level Two charging stations at its parking garages. The Level 2 stations will provide faster charging, though the exact charging rate hasn't been specified. I don't have an electric car ... yet. But, I've seen everything from a Tesla Roadster to Zero Motorcycles driving around town. It's encouraging to see the city of Santa Fe start to provide the necessary infrastructure for charging electric vehicles. PlugInCars.com - How Fast Can You Really Charge Your Plug-in Car?